Late 18th Century Thai Bronze Garuda - Mabuhay LTD. Listed as Circa 19th Century , although the previous owner a retired judge in southern Thailand, dates it over 300 years old. Garuda as the masthead of Thai royal barge. Thailand uses the Garuda (Thai: ครุฑ, khrut) as its national symbol, as well as their currency. One form of the Garuda used in Thailand as a sign of the royal family is called Khrut Pha, meaning "Garuda, the vehicle (of Vishnu)." The statue and images of Garuda adorn many Buddhist temples in Thailand. It also has become the cultural symbol of Thailand. 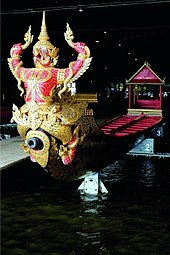 The figure of Garuda also installed as the figurehead or masthead of Thai royal barges.